Last year, Netflix blessed humanity with a live action series adaptation of the popular children’s books “A Series of Unfortunate Events” by Lemony Snicket. This gloomy story follows the highly intelligent Baudelaire children and the unfortunate events following the death of their parents in a terrible fire, all told from the perspective of inquisitive narrator Lemony Snicket. In this most lamentable story, the children are shunted from guardian to guardian while being pursued by the evil Count Olaf, who is out to steal the large fortune left to the Baudelaire orphans. The first season was everything fans wanted from the series, and so much more. The writers weaved in a much more compelling backstory for the Baudelaire family, the guardians, and the secret organization VFD. In Season 2, the writers really brought it to a new level- so much so that I almost became more interested in these new backstories than the primary story surrounding the Baudelaires. This by no means lowers the quality of the second season. On the contrary, this only made the series more interesting and watchable, but it is something unusual that needs to be mentioned. The disguises, acting, and absurdity have reached a whole new level this season, which are only elevated by some truly superb performances by the cast. Neil Patrick Harris returns as the wonderfully conniving Count Olaf and Patrick Warburton returns as the melancholy narrator Lemony Snicket. As always their performances are on point and pull the audience straight into the show with their combination of gloom and comedy. Season 2 also had the addition of two other great castings- Nathan Fillion as Jacques Snicket (the smooth and dramatic brother of Lemony Snicket) and Lucy Punch as Esmé Squalor (the eccentric and psychotic girlfriend of Count Olaf). Fillion and Punch’s performances were probably the best of the season, particularly Punch’s. Esmé Squalor is a character that you just love to hate, and Lucy Punch is just on point and overall hilarious (particularly in Chapters 6 and 8). One thing that helps this season stand apart from the first season is the fact this season is the first time we have visually seen this part of the story. The first season, which covered the first four books in the series, seemed to live a bit in the shadow of the 2004 film starring Jim Carrey, who played Count Olaf. The film was a great adaptation in itself, and Jim Carrey was pure perfection in the role. While Neil Patrick Harris is also excellent as the kooky criminal, it was a bit difficult to disassociate the first three chapters of season 1 with the theatrical movie. I found myself wanting the same story/performances as the movie when I watched Season 1. Season 2, however, is completely new territory for the series, making it easier to be absorbed into these stories and characters that lovers of the film have not yet experienced. The show has really found its legs, and is now strongly walking out of the shadows of the past and into the sun. Unfortunately, one thing to mention is that there is a bit of unavoidable redundancy in the overall story. As the series goes on, the show basically gives us the same exact thing in each chapter: the Baudelaire’s go to live with a new guardian, Count Olaf appears in a new disguise, no one believes the Baudelaires, and then they have to expose him, then he gets away again. I understand that it is expected that the adults are meant to be a bit dim-witted, but it does start to get old after a while. Fortunately, the children begin to take a more active role this season. Chapter 5 (The Austere Academy) is a bit slow and still retains some of the Baudelaire’s passiveness of Season 1; however, starting in Chapter 6 (The Ersatz Elevator) and continuing through the rest of the season, the children progressively take a more active role in their survival, which is accelerated after the events of Chapter 7 (The Vile Village). Before, it was always Mr. Poe or Count Olaf who determined the actions of the children. Once the children are on the run, they have to make the decisions surrounding their fate. 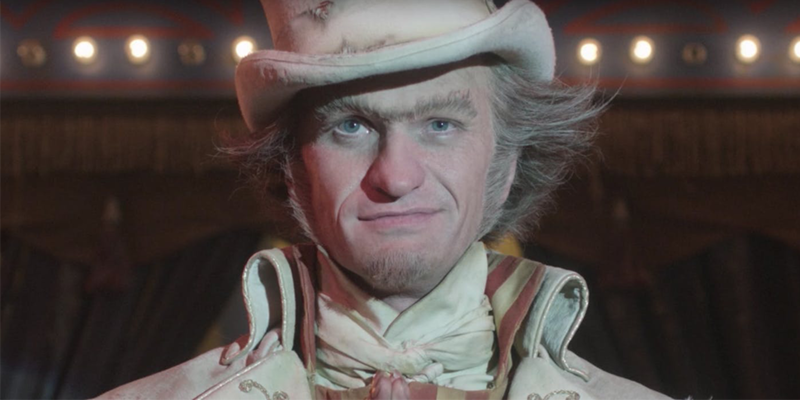 Now, there is one gaping plot hole that needs attention- should Count Olaf ever successfully kill the Baudelaires, how is he legally supposed to get the fortunes of the Baudelaires if he is not their legal guardian? Count Olaf is a wanted murderer who has absolutely no right to the fortune of these children. So…why does he seem to believe that he can still get the fortunes if he kills them? Wouldn’t it make much more sense for him to be doing all of this out of vengeance now? Audiences are smart, and plot holes like this can strongly impact a show in a negative way. The most logical explanation is that there is a much deeper plot weaving its way through the show, and there were some strong hints in Chapter 9 (The Carnivorous Carnival) that there is more to Count Olaf’s story. Lastly, I want to discuss the unusual tone for this series. The original books were meant to be children’s books even though they tended to become more gruesome as the stories progressed. They were always meant to be a combination of comedy and drama, like a quirky, more realistic take on The Addams Family. What this show is able to accomplish is unbelievable. The world feels just real enough to create the drama while being strange enough to invite comedy. The show never shows gore in the deaths of certain characters, but it never shies away from the fact that his is supposed to be a dark and sad TV show. Neil Patrick Harris and the other villains can be quite evil, but the world around them causes them to be comedic and musical (Count Olaf has at least two full singing numbers in this season alone). It really creates the perfect atmosphere for these unfortunate events, and it is a testament to the art designers, production designers, set designers, and costume designers, as well as the writers. The look and tone of the world is spot on, and it allows the characters and these events to happen in a way that fits perfectly in the story that Daniel Handler (alias Lemony Snicket) created years ago. And it helps that Daniel Handler himself is the head writer and executive producer of the series. Well done, sir! Overall, the second season answered as many questions and it created. It is a marvelous adaptation with intriguing characters and unusually unfortunate events. Despite a few small story problems, this series is as enticing as it is unfortunate. The season ended on a major cliffhanger (literally), which will definitely have audiences velcroed to their seats when Season 3 launches next year. We have so far experienced 9 of the 13 books, so next season will, sadly, be the last. But with so many stories and characters to wrap up, it will no doubt have a great, unfortunate ending.